Join authors Kristin Reynolds and Nevin Cohen for a discussion of their new book: Beyond the Kale: Urban Agriculture and Social Justice Activism in New York City. Urban agriculture is increasingly considered an important part of creating just and sustainable cities. Yet the benefits that many people attribute to urban agriculture— fresh food, green space, educational opportunities—can mask structural inequities, thereby making political transformation harder to achieve. Realizing social and environmental justice requires moving beyond food production to address deeper issues such as structural racism, gender inequity, and economic disparities. Beyond the Kale argues that urban agricultural projects focused explicitly on dismantling oppressive systems have the greatest potential to achieve substantive social change. Kristin Reynolds, Lecturer in Environmental Studies, Food Studies, and Environmental Policy and Sustainability Management at The New School. Nevin Cohen, Associate Professor at the CUNY School of Public Health. This event is sponsored by: the Tishman Environment and Design Center, Environmental Studies, Food Studies, and Environmental Policy and Sustainability Management at The New School. 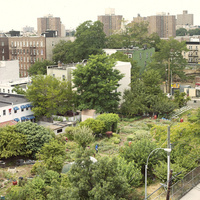 Beyond the Kale: Urban Agriculture and Social Justice Activism in New York City was published in 2016 by the University of Georgia Press.